I've had a bit of a break from blogging.. and with that has come A LOT of reading.. and even more book buying! I think I seriously need to consider a book buying ban *she says after just buying a load more books* - but let's be honest that's never going to happen, haha! (By the way, if you want to see all the books I've been buying recently and actually see me 'in-action' ignoring my bank balance you can follow me over on goodreads, the link is right here!) 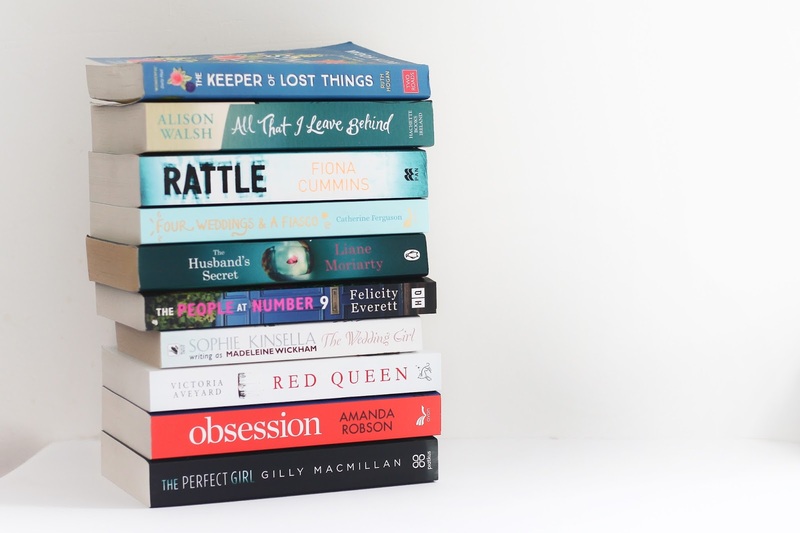 So yes, it comes as no surprise that my first post back has to be my August book haul... and yes, I'm aware that it's now September but better late than never! A lot of these books I actually bought on my holiday to Wales (which I will be telling you all about in my next post!) where I discovered that The Works has a freaking amazing book deal where you can get your hands on 3 books for £5 (not spon.. but if they want to spon they totally can, haha!) ... I genuinely spent most of that day telling everyone how amazing that deal is when you could end up spending £7.99 on one book in other shops - hi The Works, if you need a spokesperson, I'm available, lol! So as you can imagine, I did end up buying a few too many books and I can't wait to share them all with you - let me know in the comments if you've read any of these and what you thought of them, and also what are you reading at the moment?! I would love some recommendations! THE KEEPER OF LOST THINGS - RUTH HOGAN // So this is the only book in this haul that I've gotten around the reading already and it really was such a gorgeous, heartwarming read for my holiday. The book follows two parallel stories which are connected and come together in such a snug little way! I really enjoyed the many different genres this book presented too it has a bit of everything really; romance, comedy, mystery, magic and even ghosts.. so I feel like it's really got something for everyone and I couldn't recommend it more! ALL THAT I LEAVE BEHIND - ALISON WALSH // I've definitely heard mixed reviews about this one and to be honest I'm not 100% sure what it's about! All I know so far is that is seems like quite a sad read about a family who are suffering after the disappearance of their Mother - it definitely seems different from anything I've read before and I'm willing to give it a go, despite some of it's negative reviews! RATTLE - FIONA CUMMINGS // I knew I wanted to pick up a few scarier reads for October as I love reading horror/thriller books in the lead up to Halloween and Rattle seemed like the perfect pick! I'm especially excited since I've read from reviews that this book is actually pretty sinister and terrifying and I have yet to be scared of a book ever (despite being almost halfway through Stephen King's It.. okay it's a bit unsettling but I would say I'm scared, haha!) so I want to see if this actually scares me! Also, please tell me I'm not the only one who has a weird obsession with serial killers and things like that... because as soon as I saw that this was a book about a serial killer I got excited, it's definitely my cup of tea! FOUR WEDDINGS AND A FIASCO - CATHERINE FERGUSON // On the other end of the scale is this light-hearted romance by Catherine Ferguson, haha! I actually wish I had bought this before holiday because it seems like the perfect book to read on a beach in the sun...which is basically all I did on holiday, haha! But maybe I'll save it for the Christmas season since I always love a feel good book in December! I've actually gotten really into romantic comedy books since reading Lousie Pentland's book Wilde Like Me so I'm excited to read all about the struggles of Katy Peacock the wedding photographer! THE HUSBAND'S SECRET - LIANNE MORIARTY // After reading and seriously loving Truly Madly Guilty by Lianne Moriarty I knew I had to pick up some of her other books, this book was also on my book wishlist - so I mean after seeing The Husband's Secret in a charity shop for 99p I couldn't really say no, could I?! I have to say, books like this are probably my favourite to read - gripping and thought provoking mystery books that you don't want to put down.. so yes, very excited for this one! THE PEOPLE AT NUMBER 9 - FELICITY EVERETT // I don't know what it is about thriller/mystery books about neighbours that I love but I really do - The Couple Next Door and Behind Closed Doors were two books I seriously fell in love with after reading them at the start of this year and The People At Number 9 is definitely giving me the same vibes! THE WEDDING GIRL - SOPHIE KINSELLA (Madeline Wickham) // It's no surprise that I'm a huge fan of Sophie Kinsella - I love her light-hearted fun romantic comedies so when I saw that she was writing as Madeline Wickham I was definitely intrigued! From reviews I can tell that this is definitely nothing like Sophie Kinsella's usual fluffly light reads and has a little more depth and edge to it so I'm excited to see how that pans out! RED QUEEN - VICTORIA AVEYARD // I don't want to admit it, but I always tend to stay away from fantasy books... I've never really enjoyed them, probably due to my huge lack of imagination! Don't get me wrong though, this doesn't mean I don't get jealous with everyone getting really into a good fantasy book and talking about magic systems and everything... So, basically I've decided I will give fantasy another go! I thought Red Queen might be a good place to start too, since I've heard some really good reviews and this series is obviously very hyped - so who knows, I might end up reading the lot! OBSESSION - AMANDA ROBSON // We all know I love a good thriller so this book was calling my name when I saw it on the shelf, honestly I don't know much about this book and I do definitely prefer to go blindly into thriller books.. all I know is that there are some twists and turns, none of the characters are likable and emotional turmoil is a main theme - all things that make me think I need to read this book next! THE PERFECT GIRL - GILLY MACMILLAN // And one more psychological thriller to add to the shelf! Again, I'm excited for this one despite not knowing too much, all I know is there's a death and that the book does have some chilling and creepy elements - everything you could wish for in a thriller!